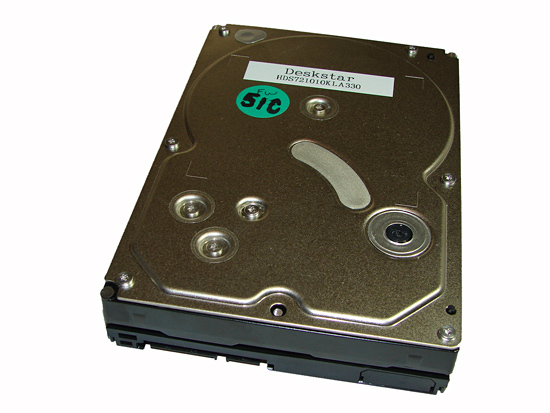 The external design of the Hitachi 7K1000 is the same as the majority of the TK or K series drives. The drive is based on the industry standard 3.5" form factor platform and would normally have the pertinent part number and warranty information embossed on a white sticker on the top of the casing. However, our O.E.M. sample was graciously provided by Dell and does not include this information. The only other differences between the O.E.M. and retail units will be the inclusion of an accessory kit, HD Feature Tool software (that can be downloaded separately), and the obligatory retail packaging. The Deskstar 7K1000 ships with the Serial ATA data and power connector along with a space for a 4-pin Molex power connector designed for use with older ATX power supplies. Our early press photos included the 4-pin Molex connector but it appears the inclusion of it will be at the discretion of the O.E.M. or distribution locality. The 32MB of cache memory and controller logic is located on the outer side of the PCB. Hitachi offers their excellent DOS based HD Feature Tool that allows the user to view the specifics of the drive and change certain options such as S.M.A.R.T., AAM, Power Management, and read and write optimizations. Our drive arrived with Automatic Acoustic Management turned on and set to the quietest level. 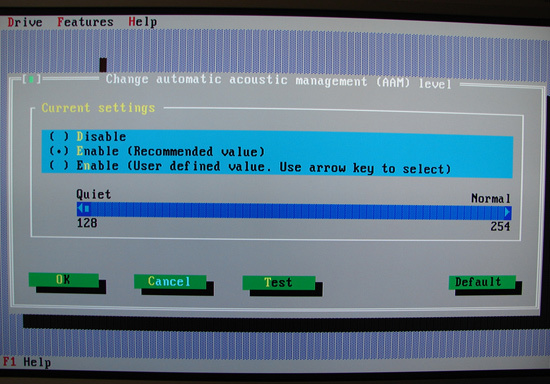 We were able to easily set different levels or turn off AAM altogether. We found in our limited acoustical testing there was not a real difference between the 128 and 256 setting. Performance was slightly affected with AAM implemented but we felt the benefits of having it turned on outweighed any performance impact. The Hitachi Deskstar 7K1000 is the first 1TB drive to ship based upon manufacturer's specifications with a 750 GB offering scheduled for availability next quarter. Of course the actual capacity of the drive is 931.5 GB, but due to the way manufacturers report capacity the drive is considered to be a 1TB offering. This drive is also Hitachi's first 3.5-inch hard drive to use PMR technology. Additional 1TB versions for the Enterprise and DVR/Set-Top markets will be released later this year. The 7K1000 features a 5-platter 10-head perpendicular magnetic recording design with rotational speeds at 7200rpm. The cache size has been increased to 32MB from the previous 16MB on the TK series. Hitachi includes their ramp load/unload, advanced low-power idle modes, and thermal-fly height control technologies. This drive series also supports Native Command Queuing and hot-swap capabilities. The Hitachi Deskstar 7K1000 drives ship with a three year warranty and additional specifications can be found here. The Hitachi 7K1000 drive we are reviewing today will be compared directly against the Seagate ST3750640AS 750GB and WD WD1500AHFD 150GB drives in our limited benchmark test suite. We have also included the results of drives from our previous articles and will provide additional results of the 7K1000 in our upcoming 500GB roundup.